The lawsuits in both of these cases are based on what most people in the affected industries have known for years: employers of low-skill labor prefer Hispanic (and mostly immigrant Hispanic) workers, sometimes to the point that they will not even consider hiring U.S.-born non-Hispanics. How did we get here? This is a story about the decline in the quantity and quality of work performed by less-skilled U.S.-born workers, along with the concurrent rise of immigrant labor as a cheap and reliable alternative. Immigration is only one part of a complicated dynamic that has caused ever-greater proportions of natives to withdraw from the labor force. However, as long as the United States receives a steady flow of low-skill labor from abroad, little incentive exists for politicians, business owners, and opinion leaders to address the problem of native idleness. The Left and the Right, for different reasons, have embraced a system that encourages the replacement of native workers—including subsequent generations of immigrants—rather than improving their prospects. This system threatens to create a politically and economically untenable cycle for lower-wage workers. Cutting off the flow of low-skill immigration could force a renewed commitment to getting Americans back to work—a commitment that must include, among other things, aggressive job recruiting and training by employers, reviving the social expectation that prime-age men must work, ending the “college for all” mindset that devalues blue-collar occupations, and strengthening work requirements as a condition of aid. In September 2017, the unemployment rate in the United States was just 4.2 percent, a low not seen since the dot-com bubble. The figure is deceptive, however, because it considers only people who are employed or seeking employment. The fraction of adults who are “not in the labor force,” meaning not even looking for a job, is 37 percent, up from 33 percent since the start of the millennium. Of course, not working is understandable and perhaps even expected for people who are elderly, or in school, or volunteering, or caring for children. Our focus here is on the Americans with no obvious or socially sanctioned excuse for not working—namely, men ages 25 to 54. When men in their prime years are not in the labor force, it raises the suspicion that they are not doing anything productive. A half century ago, those suspicions carried enough social stigma that virtually every prime-age man was either working or looking for work: just 4 percent were not in the labor force in 1970, according to data from the Current Population Survey. Slowly but surely, however, the percentage rose—to 6 percent in 1980, 7 percent in 1990, 9 percent in 2000, and 12 percent today. Unlike the unemployment rate, which fluctuates depending on economic conditions, the labor force dropout rate has marched quietly upward, affected only marginally by the state of the economy at any given time. The rise has been so gradual that it rarely generates any news stories or alarmed speeches from politicians. Nevertheless, the problem has begun to attract attention in public policy circles, with major reports published by the Obama White House, the Brookings Institution, and the American Enterprise Institute. A common finding in those reports is that, although prime-age men across the socioeconomic spectrum have been dropping out of the workforce, the problem is most acute among the less-skilled native born. A relatively low 6 percent of native-born college graduate men are out of the labor force, but 17 percent of native men with only a high school diploma are not looking for work, as are 36 percent of high school dropouts. Black Americans have a labor-force dropout rate of 22 percent. Differences across skill groups are evident not just in labor-force participation but in detailed time-diaries indicating how much people work.3 Pooling American Time Use Survey (ATUS) data from 2003 to 2015 shows that native-born prime-age men who are college graduates worked an average of 2,039 hours per year, or the equivalent of 51 full-time weeks. By contrast, native-born prime-age men with only a high school diploma worked the equivalent of 45 weeks, and those without a diploma worked just 35. Black men worked an average of 39 weeks, with considerable variation across education levels. Even within the limited sample size and time period afforded by the ATUS, some trends are clear. While the most educated prime-age men only slightly decreased their work time during the 2008/9 recession and then recovered quickly, less-educated native men saw a significant drop-off that has yet to rebound. Native men with only a high school diploma, for example, worked about 47 weeks per year before the recession, but just 43 weeks afterward. Two notes of caution are in order. First, labor-force dropout is not a universal problem for lower-skill Americans. Despite the decline in work, nearly 13 million native-born, prime-age men with no more than a high school diploma are currently working full-time jobs. Our focus is on the smaller but growing share of men whose commitment to work has faltered. A second caution is that comparing educational categories over long periods of time can be misleading. Because educational attainment has been rising, the absolute number of people in lower education categories has been falling. For example, people with a high school diploma or less were 70 percent of the prime-age male population in 1970 but are only 37 percent of natives today. Because the most industrious tend to acquire more years of education, part of the observed decline in work rates among Americans with low levels of education is due to a “creaming effect” rather than people changing their behavior. Nevertheless, creaming works too slowly to explain the ongoing declines in work among the least skilled. That point is confirmed by examining work patterns over the years for men ranked by their relative educational attainment. Since 1970, men in the top fifth of education—i.e., with higher educational attainment than 80 percent of the population in each year—saw their labor force dropout rate rise only slightly, from 3 percent to 5 percent. By contrast, the dropout rate for the bottom fifth rose from 8 percent to 21 percent. In contrast with native-born men in their prime working years, and especially those at the bottom of the skill distribution, immigrant men have high and consistent rates of labor-force participation despite their lower average education. Since the Current Population Survey began asking about nativity in 1994, typically between 7 percent and 9 percent of immigrant men have been out of the labor force, with no clear trend. Furthermore, in sharp contrast with natives, immigrant work time varies little with education. Even immigrant men without a high school diploma worked an average of forty-nine full-time weeks per year during the 2003–2015 period, fully fourteen weeks more than native dropouts. Also notable, given that the two groups are often seen as competing with each other, is that Hispanic immigrant men worked ten more weeks per year than native-born black men. Immigrants did see their work time decrease during the recession, but the effect was smaller and the recovery faster than for natives. The high labor-force participation by low-skill immigrant men rebuts the oft-heard claim that native men work less simply because there is insufficient demand for low-skill labor. The demand is still there, but immigrants increasingly provide the supply. The Obama administration acknowledged and even encouraged this replacement of native entry-level workers, recommending in one report that foreign workers should be imported to “offset some of the macroeconomic challenges associated with the long-run decline in prime-age male participation.”6 That’s already happening. While natives fell from 56 percent of the nation’s high school dropouts to 52 percent between 2003 and 2015, their share of the labor performed by all dropouts declined much faster—from 50 percent to 40 percent. By blunting the effects of the long-term decline in native workforce participation, especially among prime-age men, a sustained influx of entry-level foreign workers, predominantly Asians and Hispanics, deflects attention from this unfortunate trend. The importation of foreign labor has allowed policymakers to avoid confronting longstanding patterns of unemployment and low work effort, especially among males. The immigrant influx, and its anodyne effects on business, helps paper over a painful reality. Many employers favor recent immigrants, both legal and illegal, over unskilled native American workers. When that preference is acknowledged, which is rarely, the explanation offered is that immigrants are willing to accept lower wages and thus cost less than natives, or that they will hesitate to demand fair or safe working conditions or to sue their employer for perceived abuses. But one well-documented, important cause of employers’ preference for immigrants is the perception, widely shared and oft-expressed in anonymous interviews, that the work ethic of too many less-educated Americans is inferior and deteriorating. For a host of unskilled and entry-level positions, recent immigrants, especially Hispanics, are considered more desirable. They are eagerly sought after and preferentially hired because they are regarded as better workers. The evidence for this state of affairs comes from a body of work in the social sciences that is little known outside professional circles and almost never cited in discussions of the effects of low-wage immigration. During the last decades of the twentieth century, and through the early 2000s, a number of sociologists conducted a series of non-quantitative, on-the-ground ethnographic studies of employer attitudes toward less-educated workers. This research has mainly been focused on racial discrimination in employment and oriented toward examining employers’ experience with black employees. But in exploring employers’ attitudes toward their workers more broadly, these studies have revealed that employers hold a pronounced and remarkably consistent pecking order of preferences for workers from different racial and ethnic groups, including native-born workers as well as recent immigrants of various types. What is the evidence for these preferences? Many of the studies that document and examine employer preferences have been reviewed and summarized in a 2013 volume by John Skrentny, After Civil Rights: Racial Realism in the American Workplace (Princeton University Press, 2013), with additional important research published elsewhere. Consisting mostly of lengthy, detailed interviews with workers, managers, owners, and supervisors in small- to mid-level businesses from a range of geographical locations and industries, combined with firsthand observations of interactions on the job, this body of ethnographic research indicates a steady shift in employer attitudes and practices since the 1980s. As Skrentny and others document, for many entry-level jobs requiring no more than high school and few if any “hard” skills—such as basic academic proficiency or knowledge—employers are candid about their strong preference for new immigrant workers over natives. Study after study makes clear that “employers of low skilled workers have become increasingly enamored of Latinos . . . [and] Asian workers,” and that, in the eyes of many businesses, “immigrant status seem[s] to be a major plus for both groups.” In contrast, American laborers, “including whites, but especially blacks,” have become “the least desired group” of workers. Although white native workers are seldom considered equal to Asians and Latino immigrants, black workers, especially from inner-city backgrounds, are routinely disparaged and avoided. One of the first studies in this area reported by Skrentny, which was widely influential in galvanizing interest in on-the-ground research on low-wage employment, was published in the late 1980s by sociologists Joleen Kirschenman and Kathryn Neckerman.7 Working with the well-known sociologist William Julius Wilson, they conducted and reported on interviews with hundreds of Chicago-area employers and managers. When assured of anonymity, those in charge repeatedly bemoaned the poor quality of the native workforce, especially blacks. What emerges clearly from their research is employers’ uniform preference for Hispanic and Asian immigrants, as well as praise for the work habits of those groups as compared to native workers. The chairman of a car transport company claimed, “The Oriental is much more aggressive and intelligent and studious than the Hispanic.” He went on to say that Hispanics have the strongest work ethic, while native-born blacks are “the laziest of the bunch.” Similarly, a manager at a suburban bakery complained that “we have some problems with blacks. . . . I find that the blacks aren’t as hard workers as the Hispanics. . . . The black kind of has a you-owe-me kind of an attitude.” A manufacturing foreman stated that unskilled blacks have “no work ethic.” Yet another supervisor stated that blacks “tend to laziness . . . people are willing to give them a chance and then they get the chance and then it’s like they really don’t want to work.” Another employer lamented that “the first chance [blacks] get, they’ll slack off, they don’t want to do the job, they feel like they don’t have to, they’re a minority.” Many employers interviewed for the study were at pains to point out that, in contrast, these vices are quite rare among immigrant workers. Similar attitudes emerge from a study by economists Philip Moss and Chris Tilly, who conducted 365 interviews at 174 firms in Atlanta, Boston, Detroit, and Los Angeles.9 According to their 2001 report, as Skrentny relates, most of the businesspeople interviewed praised the qualities of immigrant Latino and Asian workers, and sought out those workers for their entry level and low-skill jobs. Immigrants were asserted to be “more willing to work” and “to work longer hours. . . . They’re diligent. They do their job. They don’t complain much.” One Los Angeles garment factory manager stated “I think the work ethic for Hispanics is better than it is for blacks,” but also that “whites wouldn’t do the type of job” available in their facility. “They just don’t have the stamina or the, you know, humility to do that type of job.” Other employers praised Asian workers, characterizing them as “very good” and “diligent” with “a completely different work ethic.” One stated that if you “need them for seventy-two hours a day, they’ll be there.” Black native workers came off badly in this study. A majority of employers stated that black American workers had poorer soft skills (relating to attitude, grooming, willingness to cooperate, motivation) as well as inferior abilities in math and basic mechanics, as compared to immigrant Latinos and Asians. Likewise, research on the hiring preferences of garment factories in New York City, which are largely Asian owned and managed, revealed similar patterns. Sociologist Margaret Chin found that, in recent decades, garment factory owners avoid hiring blacks, whether native or immigrant, with some commenting that blacks are “just too lazy,” that they fail to persist on the job, and that they “are not dependable.” These employers extend this aversion to the large urban population of Puerto Rican workers, who are also viewed as impersistent and unreliable. Their preferences result in a workforce that is almost exclusively Asian, with a predominance of recent immigrants. Nepotism is surely at work here, since these workers are almost all hired through a network of contacts maintained by current workers using informal recruitment through social circles, relatives, and word of mouth. But the perceived weaknesses of the native workforce clearly give these businesses little incentive to move beyond nepotism and broaden their worker pool. Employment patterns and the outlook of construction companies involved in rebuilding New Orleans following Hurricane Katrina also indicate that racial preferences influenced hiring in some industries. In a city that was only about 3 percent Latino in 2000, half the reconstruction workforce was Latino, with most of those undocumented. As recounted by John Skrentny, construction supervisors admitted to seeking Latino workers because “they believed they were the best workers” and that Latinos “had the ability to do things that the native population lacked.” One contractor, himself a Latin-American immigrant, explained in an interview on National Public Radio that “you hire African Americans, they all want the easy way out. They don’t work long hours; they always want breaks; they’re not loyal.” The companies also noted that Latinos were easy to recruit. Many were willing to travel far from home and relocate to take the available jobs. In sum, study after study reveals that employers display a clear and avowed preference for Hispanic and Asian immigrants over low-skill natives of all backgrounds for a host of entry-level jobs across a range of industries in a variety of geographic locations. Are these employers simply bigots who traffic in unfounded stereotypes about nativity and race? The ubiquity of their views suggests that the issue goes beyond that, as does the fact that employers often disparage the work ethic of their own groups. As the ethnographic literature reviewed by Skrentny reveals, employers from all backgrounds—white, black, or immigrant—prefer immigrant workers and shun natives, especially blacks. For construction firms in Atlanta, for instance, Skrentny reports that supervisors, regardless of their own group identity, “all tended to praise the racial abilities of Latinos and denigrate those of blacks and whites.” He adds that “what evidence there is” suggests that black employers’ hiring practices “are not at great variance with the race-realist strategies of white employers.” Furthermore, businesses pursue profit above all else, and the market generally punishes irrational hiring. If employers avoid native workers for baseless reasons, other businesses could gain an advantage by hiring the natives who are shunned. We know from the labor-force data that immigrants have replaced less-skilled natives in the labor force over time, but do studies of employer attitudes prove that native workers are pushed out (or displaced) by immigrant workers on a wide scale? Although the research discussed in this article does not claim to be quantitative, nor to undertake a systematic and comprehensive look at workforce patterns, the results are remarkably uniform and highly suggestive. Employers prefer immigrant labor, and there can be no doubt that those preferences routinely translate into action. Although other factors are in the mix, the main reason is the observation that immigrants make better workers. Employers’ perception that immigrant workers are, on average, superior to natives clearly influences their employment strategies and decisions, with many businesses willing to go to great lengths to find and hire workers they favor, and to avoid those they do not. This means that, in many circumstances where immigrants and natives vie for the same positions, immigrants are hired and natives lose out. This is not in itself definitive proof that Americans are being displaced by immigrant labor, or that immigrants contribute to joblessness among low-skill Americans. But it strongly suggests this possibility, especially when coupled with the steady decline in native workforce participation among the least skilled. Surveying decades of evidence for employment in the New York City area, Roger Waldinger similarly concluded that “the data and case studies demonstrate a steady erosion of African Americans’ share of the large number of remaining, low-skill jobs—even as the number of low-level jobs held by minorities, native and immigrant, steadily grew.” In fact, blacks had relatively high levels of employment in entry-level positions in New York decades ago: “Circa 1940, the workforce was 66 percent black native workers, 6 percent Hispanic foreign-born, and 2 percent Asian foreign-born.”23 But by 1990, those numbers had significantly shifted, with the black native-born population comprising only 30 percent of the workforce, compared with Hispanic foreign-born at 20 percent and Asian foreign-born at 15 percent. Whether immigrants “pushed out” native blacks is unclear, especially since black representation in jobs in the hotel industry began to erode “before the new immigrant influx.” Although this does indeed suggest that some supply-side factors are at work, it is nonetheless the case, especially in light of high urban black unemployment, that immigrants are now doing jobs that Americans used to do, and could be doing. Finally, we alluded in the introduction to EEOC complaints in which employers are charged with deliberately avoiding non-Hispanic workers. These cases are perhaps the clearest evidence for immigrant displacement of native workers, at least in certain industries and contexts. For example, in EEOC v. Little River Golf, Inc., a provider of real estate support services in Pinehurst, North Carolina, agreed to a settlement after terminating six black employees under the guise of a layoff and immediately filling the vacancies with Hispanic workers.24 In another case, EEOC v. Paramount Staffing Inc., a temporary staffing agency agreed to settle claims that they employed Latino workers over blacks and, in retaliation, terminated employees who objected.25 Yet another large settlement was reached with a Chicago-based supplier of janitorial services that advertised for workers only in Spanish-language newspapers and imposed additional layers of requirements on blacks that enabled Latinos to be hired ahead of them. black native population, more research is needed that focuses on employer preferences and practices toward the full spectrum of native-born workers, with special attention to the white working class that is now suffering from sinking economic prospects. In addition, ethnographic research on employer personnel preferences is no longer in fashion, so few studies cover the past two to three decades. New research is needed to examine whether managers believe that the quality of the native-born workforce is inadequate or continues to deteriorate. Whether low-wage immigrants displace American workers and contribute to native unemployment or workplace withdrawal is a question that has long preoccupied economists. The contribution of this piece is to highlight two aspects of the evidence that are often overlooked and deserve greater attention. The first is that native workforce participation has steadily declined as low-wage immigration has increased and is now at historic lows. That situation tells us that immigrants are performing entry-level work that less-educated native workers are not doing, even though low-skill Americans are increasingly available to perform these tasks. The second points to an extensive ethnographic literature on employer preferences, which has not until now been brought into the debate on low-wage immigration. That research shows that businesses widely regard American-born low-skill employees as less desirable than immigrants. In addition, there is evidence that businesses actively work to recruit immigrants and avoid native workers, with black entry-level employees the least favored. The evidence suggests that both demand- and supply-side factors play some role and reinforce one another to contribute to the growing presence of immigrants in key low-wage positions. Some managers express the view, which is consistent with the oft-heard mantra that unskilled immigrants perform “jobs Americans won’t do,” that native workers are less willing to take some kinds of jobs or to persist in those positions. But it does not follow that immigration has no effect on native low-wage employment. As John Skrentny describes it, “There are dynamics in the mix that can result in some ethnic or racial groups voluntarily abandoning a niche, opening it for others, or self-segregating on the job.” The narratives recounted above suggest that abandonment can follow from, and respond to, a concerted effort by management to change the demographic profile of a particular workplace or to make natives unwelcome. More importantly, however, the research indicates that this avoidance, whatever its extent and provenance, too often results in native American idleness or a desultory dabbling in the informal economy. The clear implication is that currently underemployed Americans are available to do at least some, and perhaps much, of the work that immigrants currently perform. skill foreign workers. The reluctance of business owners to seek out and employ unskilled black workers, and especially men, often means that the connection between black unemployment and the push for more foreign workers is studiously avoided. Policy elites advocate for what is effectively an open borders regime while supporting a divisive multiculturalism at home. Realistic discussions of actual behavior and cultural differences are banished as racist and xenophobic. A racism narrative becomes the sole explanation for persistent high levels of black unemployment. As to the white working class, job shortages are blamed, while immigrant labor continues in demand. Why restrict immigration? Replacing American workers with fresh waves of low-skill immigrants is not a viable long-term strategy for our country. Despite some immediate economic benefits for employers, large shareholders, and consumers, albeit with substantial offsetting fiscal costs, mass importation of low-skill workers is both demoralizing and risky in the longer term. Even apart from institutional and cultural effects—which deserve separate, extended treatment—mass low-wage immigration is demoralizing because it amounts to a strategy of replacing and displacing less-skilled American citizens from the workforce with no thought to the broader economic, social, and psychological effects on the workers themselves, their communities, and society as a whole. There is also demographic evidence that the intact families of the first generation are giving way to paternal abandonment and single-parent families, which are a growing presence in the Hispanic community. By all indications, children born in these circumstances will largely remain at the bottom of society, qualified to take on only relatively unskilled work. Also, there is some evidence that the number of entry-level low-skill jobs is on the decline, which would mean that the offspring of low-skill immigrants will be competing for a shrinking pool of jobs with other less-educated Americans. Finally, Hispanic assimilation into American norms has many positive aspects, but it also has downsides in an era when increasing numbers of native Americans with less education and fewer skills have fallen into some dysfunctional habits. Whether second-generation immigrants will continue to display their parents’ hardihood and discipline or will become more like Americans with similar education and skills is an open question. The signs are not encouraging. The ethnography reveals some employer grumbling about native-born generations of Hispanics. If the quality of the second generation of immigrants deteriorates, that will only start the cycle over again, with renewed demands for fresh recruits from abroad. What is to be done? First and foremost, our country must redouble its efforts to control illegal immigration. Most effective would be mandating the E-Verify system to ensure employment eligibility of all new hires, as well as finally implementing the biometric entry and exit system, first authorized by Congress in 2002, that would help identify visa overstayers. Without these initiatives, other efforts will prove far less effective. It goes without saying that formidable obstacles, largely political but also practical, exist to making good on these goals, and they will not be elaborated on here. But enforcing the law is a key element of any attempt to tackle the problem. The laws of supply and demand suggest this would happen. In a book-length report published last year, the National Academies of Sciences (NAS) found that the overall impact of immigration on American wages is small, but “a high degree of consensus exists that specific groups are more vulnerable than others to inflows of new immigrants.” The vulnerable groups are the workers with whom newly arrived foreign workers most directly compete—namely, prior immigrants and natives with low levels of education. The NAS lists nine different studies that find negative wage effects on those groups, with a typical result being that a 10 percent increase in immigration causes a 5 percent decrease in wages.30 The wage question is contentious, however, and some economists remain unconvinced. Part of the problem is that empirical studies must attempt to isolate the effect of immigration from the myriad other influences on wages, and such attempts can quickly bog down in technical debates with no resolution. Improved working conditions would also help. Based on his ethnographic study of a Tyson Foods plant in Arkansas, anthropologist Steve Striffler recently documented the stressful, inhospitable, dangerous conditions that prevail in that industry.34 Although many of the service, construction, production, and agricultural jobs that low-skill immigrants now perform are inherently arduous, there is room to make them less risky and harsh, and businesses should be encouraged to do so. In addition, tighter immigration rules may well entail higher consumer prices and a decline in corporate profits. But none of these changes will occur spontaneously, due in part to economic pressures from shareholders and managers. Reducing the influx of unskilled workers may be the only tactic that will moderate these forces. But immigration reform is just a necessary starting point. Reintegrating native unskilled American workers into a more central role in the economy will require significant cultural and practical shifts on many fronts across different sectors of society, including elite opinion leaders, politicians, philanthropists, the education establishment, young college graduates, the media, business, black leaders, and the working class itself. All must confront stubborn labor market changes dictated by larger economic and global forces. In addition to facing up to the pernicious “narcotic influence,” in the words of the late Cornell labor economist Vernon Smith, of high levels of immigration on business and policymakers, our society must also deal with a crisis in the socialization of less-educated men, widespread and growing drug abuse, and the misguided emphasis on pushing ever more young people into college. We also need to rethink our counterproductive attitudes toward essential but unglamorous low-skill work. Realism about all of these forces—call it a new labor market realism—is in order. Elite opinion leaders and policymakers must stop demonizing all critics of open-borders immigration policies as racists and xenophobes. They must face the fact that, in many cases, businesses do in fact favor immigrants over native-born Americans, especially blacks, based on differences in worker quality, whether actual or perceived. They should consider whether unrestricted immigration has contributed to making native-born workers less competitive. Opinion leaders should also abandon the demoralizing and ill-conceived mentality that regards most young people as potentially college-ready, treats lack of higher education as an unfortunate failure requiring societal correction, and sees joining the cognitive elite as the ultimate hallmark of a decent and worthy life. The country’s education policies should therefore emphasize job preparedness and vocational training. Germany, Holland, and northern European countries provide worthy models, with the majority of high school graduates enrolled in job-linked programs. Relatedly, a renewed cultural emphasis on recognizing the dignity of work of any and all kinds, whether career-oriented or not, with a moratorium on talk of “dead-end jobs,” would be desirable. Male idleness should be re-stigmatized, and the expectation that all able-bodied men as well as women will contribute to self-support should be given renewed emphasis. It is also important to stress that the government is not and cannot be the guarantor of “good jobs.” Rather, such jobs are mostly the product of private enterprise, which depends on workers equipped, ready, and able to provide the goods and services that people actually desire. The leadership class should furthermore rethink its uncritical invocation of the category of “jobs Americans won’t do.” Workers with limited education and few skills should be urged and expected to take the jobs that are actually available and that immigrants are currently performing, especially as part of the quid pro quo for lower and slower rates of immigration that many ordinary Americans would welcome. That tack depends on accepting the inconvenient fact that too many Americans—including an increasing number of high school graduates—are not presently equipped, whether due to paucity of skills, poor work habits, drug use or addiction, or other causes, for many of the more lucrative jobs available in the economy. Indeed, for many of the same reasons, they are barely able to meet the basic requirements for any job. Finally, opinion leaders should stop looking askance at “America First.” Indeed, they should embrace it. The well-being of Americans outside the college-educated class should be placed front and center and our national priorities reordered to turn our full attention to our fellow citizens from all races and backgrounds. In the name of reintegrating this population, we should turn away from replacing them. Rather, we should seek to understand and support restrictions on, and restructuring of, immigration laws to honor citizens’ economic well-being as well as their legitimate interest in familiar communities and cultural stability. Instead of gravitating to programs and services for fashionable global projects, newly minted college graduates should focus on the “forgotten man,” the less-educated native population at their doorstep. College graduates could be encouraged to start new businesses or charities that could create and staff programs to supervise, socialize, train, and support low-income labor, as well as assist businesses in employing them, with the goal of making native workers more attractive, increasing work effort and efficacy among the formerly idle and unemployed, and familiarizing people with employer demands. Initiatives to assist the less skilled in finding work, performing well, and persisting in the workforce, like those described in Peter Cove’s new book Poor No More (Transaction, 2017), should be expanded and extended.35 Intensive efforts should be made to supervise and aid the growing ranks of ex-convicts. Finally, the young and educated should devote their time and attention to tackling opioid addiction by working with addicts or organizations attempting to address this problem. help societies, volunteer organizations, small-scale employers, community or union-sponsored training programs, and others. Politicians and the leadership class should advocate for marriage and rebuilding the two-parent family. Research done by MIT professor David Autor and others indicates that the explosion in single parenthood has contributed to educational failure and poor socialization among boys.36 In addition, more than one worker is often necessary to maintain a viable household in the current economy. Especially for people with modest earnings, orderly and stable relationships are essential to economic well-being. Although no one knows how to reconstruct the nuclear family, a concerted societal consensus surrounding this goal might help turn the tide. Politicians should focus on reforms needed to tighten up on policies that encourage people, and especially men, to leave and stay out of the workforce. This does not necessarily mean slashing funds for the needy, but rather tying them to joining the workforce or developing skills. Like welfare disbursements under TANF (the federal program for single-parent families), food stamps should be tied to work requirements. Policymakers also might consider increasing wage subsidies in exchange for reducing spending on programs not linked to work. Reforms designed to reduce regressive levies for Social Security and Medicare should be on the table as well. Criteria for receiving disability benefits should be tightened and programs more carefully monitored, and the federal government should consider adopting the partial disability regime that prevails in some European countries, which encourages people to perform some paid work despite infirmities that impede full-time employment. Government benefits and tax rules that penalize marriage and higher earnings need to be scrutinized. Unfortunately, means-tested programs that phase out as income increases, such as the earned income tax credit (EITC), inevitably discourage effort and marriage. It is difficult to blunt these effects without vastly greater expenditures. Reform is nonetheless a worthy objective. What about the role of business? Businesses will understandably resist the dislocations that will inevitably result from a drastic decline in low-skill immigration. In fairness, the entire burden of reintegrating and upgrading America’s native low-wage workforce should not fall on business, because they are not primarily responsible for any shortcomings they might find in the native worker population. As noted already, other social actors can and should mitigate these difficulties by assisting businesses with programs of supported work, training, socialization, supervision, and perhaps subsidies. At the same time, however, conservative elites need to recognize that the corporate sector does have obligations to the larger society, and that increasing corporate and financial-sector profits is neither the sole nor the highest aim of policy. The native workforce also needs a dose of labor-market realism. The less-educated population is the most likely to support lower levels of immigration, for a mix of cultural and economic reasons. Yet these voters must accept that there is a quid pro quo for the changes that they seek, and that there are broad economic forces at work that even our most learned “experts” don’t quite understand. “Good” manufacturing jobs are on the decline and cannot easily be recreated anytime soon. Although rightly demanding that businesses meet them partway with better pay and benefits, they need to turn back to “the jobs American won’t do” by taking on the work that actually exists in our economy and must get done. Workers should also face the fact that, at least in the eyes of those who would employ them, too many are in desperate need of an upgrade. They must tackle the dysfunctions that impede their employability, including poor work habits, uncooperative attitudes, lack of reliability, chaotic families, profligacy, and drug addiction and abuse. These words suggest an important role for our politicians and opinion leaders. Elites should be more willing to address shortcomings of American workers. Obviously this is a tough sell, since people don’t like to be told about their defects or urged to take responsibilities for their own predicament. Political expediency and ideology, including the impulse to see the less economically fortunate as victims of intractable external forces, fuel the reluctance to impose expectations or assign any responsibility to the working class or to recommend that they change their ways. And books like Amy Goldstein’s Janesville: An American Story (Simon and Schuster, 2017) and others of its ilk poignantly document the hardships faced by less-educated Americans trying to make a living in difficult economic times that are not of their making.39 But the evidence on increasing idleness, addiction, and demoralization implies there is nonetheless room for improvement, especially in tighter job markets. Those at pains to reject immigration restrictions and the rest of the agenda proposed here will advance various arguments in favor of continuing current practices or adopting different tactics to curtail any abuses. Some critics believe that employers tend to hire immigrants, and especially illegals, because they are cheaper and more tractable. They will accept lower wages and fewer benefits, are almost never unionized, and rarely if ever invoke legal protections or sue to vindicate their workplace rights. The proper response to these factors, it is contended, is to provide a path to legalization, so that immigrants can enjoy the same rights and protections as Americans. Alternatively, if the problem is that foreign nationals will work for less without complaint, then stricter steps should be taken to enforce employment laws and raise wages. The problem with these arguments is that although the effect of immigrants on labor costs may well play some role, ethnographic investigations do not indicate that savings from lower pay and benefits, or the prospect of fewer lawsuits, are the principal reasons employers favor immigrants over natives. Although employers assign some value to immigrants’ reluctance to complain, the virtues stressed most often are diligence, loyalty, reliability, work effort, and work ethic. But even if compensation levels are a factor, tolerating or encouraging the influx of large numbers of unskilled foreign nationals is unwise, and immigration restriction is still the strategy of choice. It will be virtually impossible to get businesses to pay more for low-skill labor if fresh reinforcements from abroad continuously flood the market. Another argument made by some economists, and endlessly repeated in the popular press, is that immigrants in entry-level positions clear the way for Americans to fill slots higher up on the job ladder requiring more skills, English proficiency, customer interaction, or specialized training. This no doubt happens for some natives, but the ethnographic research on employer preferences is hard to square with a story of general uplift. Employers seek out immigrants and shun the least educated natives not because the latter group possesses skills and strengths lacking in unskilled immigrants, but because of perceived inadequacies that make native workers undesirable for jobs of any kind and at any level. As noted earlier, the capacity of many less-educated natives to change jobs or upgrade their skills in response to immigrant competition is limited. Calls for natives to move into English-intensive work, for example, ignore the fact that less-educated natives often have poor reading and writing abilities. On a recent test of English literacy, 30 percent of native men without jobs scored “below basic,” which means they will struggle with most service and supervisory work.40 This data, plus employer observations, belie the conclusion that immigrants don’t take jobs from the least qualified Americans, but rather push natives into more rewarding niches to which they are better matched. In sum, the main objections advanced against the hypothesis that quality-based employer preferences for immigrant labor contribute to the displacement and replacement of Americans, and against the argument that immigration restriction is the tactic of choice to address this problem, are unconvincing in light of the evidence presented here. Our emphasis in this article is on reintegrating less-educated Americans into the economy and the world of work, with the aim of enabling them to make a constructive contribution to their communities and our nation. That is a massive project that must and should be tackled on many fronts by Americans of all stripes. An essential first step is to turn off the spigot of unskilled foreign workers. Is there any serious hope that our country will adopt the strategies we advocate here? The situation is not encouraging. Americans are now starkly divided by class in their attitudes toward immigration. As Mark Krikorian has said, immigration is not a left-right issue, but top-down. Business interests and economic libertarians in the Republican party push for more low-wage labor, while ethnic pressure groups have become a primary constituency of the Democrats. Both sides embrace an ideology of one-world globalism, which conveniently aligns with their upper-income class interests. This coalition often comforts itself with the belief that mass immigration is not detrimental—and perhaps is even beneficial—to the low-skill Americans with whom the newcomers compete. We beg to differ. For now, the elite leadership consistently wins the day on immigration, and the less privileged bear the brunt. Perhaps a more realistic understanding of the trade-offs inherent in low-skill immigration will encourage action on real reform. Whether that will happen remains to be seen, but the issue will inform our politics for years to come. 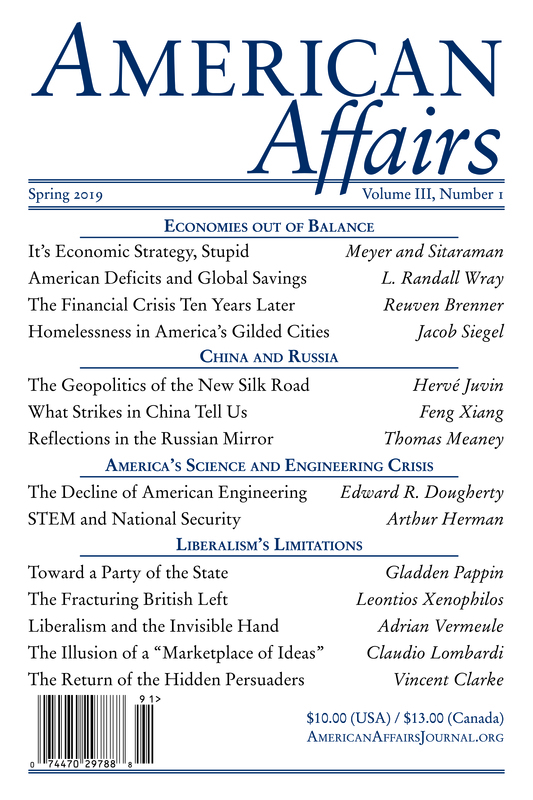 This article originally appeared in American Affairs Volume I, Number 4 (Winter 2017): 160–92. 1 EEOC v. Lawler Foods, Inc., No. 4:14-cv-03588 (S.D. Tex. 2015). 2 EEOC v. Champion Fiberglass, No. 4:17-cv-02226 (S.D. Tex 2017); L. M. Sixel, “Company Sued for Allegedly Favoring Spanish-Speaking Hispanics in Hiring,” Houston Chronicle, July 21, 2017, http://www.chron.com/business/bizfeed/article/Job-applicants-must-speak-Spanish-EEOC-lawsuit-11302801.php. 3 Jason Richwine, “Immigrants Replace Low-Skill Natives in the Workforce,” Center for Immigration Studies, Sept. 28, 2016, https://cis.org/Immigrants-Replace-LowSkill-Natives-Workforce. 4 Nicholas Eberstadt, Men without Work: America’s Invisible Crisis (West Conshohocken, Penn. : Templeton, 2016), 85–89. 5 Charles Murray, Coming Apart: The State of White America, 1960–2010 (New York: Crown Forum, 2012), 170–71. 6 White House Council of Economic Advisers, “The Long-Term Decline in Prime-Age Male Labor Force Participation” (June 2016), 41. 7 Joleen Kirschenman and Kathryn M. Neckerman, “‘We’d Love to Hire Them, but . . .’: The Meaning of Race for Employers,” in The Urban Underclass, ed. Christopher Jencks and Paul E. Peterson (Washington: Brookings Institution, 1991), 210. 8 William Julius Wilson, When Work Disappears: The World of the New Urban Poor (New York: Knopf, 1996). 9 Philip Moss and Chris Tilly, Stories Employers Tell: Race, Skill, and Hiring in America (New York: Russell Sage Foundation, 2001). 10 Philip Kasinitz and Jan Rosenberg, “Missing the Connection: Social Isolation and Employment on the Brooklyn Waterfront,” Social Problems 43, no. 2 (May 1996): 180–96. 11 Roger Waldinger and Michael I. Lichter, How the Other Half Works: Immigration and the Social Organization of Labor (Berkeley: University of California Press, 2003), 160. 12 David Griffith, “Consequences of Immigration Reform for Low-Wage Workers in the Southeastern U.S.: The Case of the Poultry Industry,” Urban Anthropology and Studies of Cultural Systems and World Economic Development 19, no. 1/2 (1990): 155–84. 13 Cameron D. Lippard, “Racialized Hiring Practices for ‘Dirty’ Jobs,” in Being Brown in Dixie: Race, Ethnicity, and Latino Immigration in the New South, eds. Cameron D. Lippard and Charles A. Gallagher (Boulder: FirstForumPress, 2011). 14 Kirstin Downey Grimsley, “Tyson Foods Indicted in INS Probe,” Washington Post, Dec. 20, 2001, https://www.washingtonpost.com/archive/politics/2001/12/20/tyson-foods-indicted-in-ins-probe/1979cb63-8d7d-4c8c-9c5f-90f0e79bbb7c/. 15 Michael Grabell, “Cut to the Bone,” New Yorker (May 8, 2017): 46. 16 Patricia Cohen, “If Workers Are Scarce, Is It the Work or the Wages?,” New York Times, July 13, 2017, https://www.nytimes.com/2017/07/13/business/economy/labor-market-wages.html. 17 Jane M. Von Bergen, “Dietz & Watson Fire Destroyed Warehouse but Forged Stronger Bonds,” Philadelphia Inquirer, Sept. 11, 2016, http://www.philly.com/philly/business/columnists/20160911_Dietz___Watson_fire_destroyed_warehouse_but_forged_stronger_bonds.html. 18 Nelson D. Schwartz, “Economy Needs Workers, but Drug Tests Take a Toll,” New York Times, July 25, 2017, https://www.nytimes.com/2017/07/24/business/economy/drug-test-labor-hiring.html. 19 Lauren Weber, “More American Workers Are Testing Positive for Drugs,” Wall Street Journal, May 16, 2017, https://www.wsj.com/articles/more-american-workers-are-testing-positive-for-drugs-1494928980. 20 Alan B. Krueger, “Where Have All the Workers Gone? An Inquiry into the Decline of the U.S. Labor Force Participation Rate,” BPEA Conference Drafts, Sept. 7–8, 2017. 21 Laura Lopez-Sanders, “Trapped at the Bottom: Racialized and Gendered Labor Queues in New Immigrant Destinations,” Center for Comparative Immigration Studies, University of California, San Diego, Working Paper no. 176 (2009). 22 Harry Holzer, What Employers Want: Job Prospects for Less Educated Workers (New York: Russell Sage Foundation, 1996). 23 Roger Waldinger, Still the Promised City? African Americans and New Immigrants in Postindustrial New York (Cambridge: Harvard University Press, 1996). Data is drawn from the Census of Population. 24 EEOC v. Little River Golf, Inc., No. 1:08-cv-00546 (M.D.N.C. 2009); Press Release, Equal Employment Opportunity Commission, “Little River Golf to Pay $44,700 to Settle EEOC Race and National Origin Discrimination Suit,” Aug. 8, 2009, https://www.eeoc.gov/eeoc/newsroom/release/8-6-09a.cfm. 25 EEOC v. Paramount Staffing Inc., No. 2:06-cv-02624 (W.D. Tenn 2010); Press Release, Equal Employment Opportunity Commission, “Paramount Staffing to Pay $585,000 to Settle EEOC Lawsuit,” Aug. 23, 2010, https://www.eeoc.gov/eeoc/newsroom/release/8-23-10.cfm. 26 See, e.g., Brent Orrell, Harry J. Holzer, and Robert Doar, Getting Men Back to Work: Solutions from the Right and Left (Washington: American Enterprise Institute, 2017). 27 Eli Lehrer and Catherine Moyer, “Putting Men Back to Work,” National Affairs 30 (2017): 16. 28 Reihan Salam, “The Case for Skills-Based Immigration: It Makes Sense Economically and Morally,” National Review (Aug. 28, 2017): 24. 29 Neel Kashkari, President of the Federal Reserve Bank of Minneapolis, speech at the Rotary Club of Downtown Sioux Falls (Aug. 7, 2017); see also Joseph Lawler, “Fed Official: Businesses Claiming Worker Shortages without Raising Wages ‘Sounds Like Whining,’” Washington Examiner, Aug. 7, 2017, http://www.washingtonexaminer.com/fed-official-businesses-claiming-worker-shortages-without-raising-wages-sounds-like-whining/article/2630836. 30 National Academies of Sciences, Engineering, and Medicine, The Economic and Fiscal Consequences of Immigration (Washington: The National Academies Press, 2017), https://doi.org/10.17226/23550. 31 William Voegeli, “Diversity and Its Discontents,” Claremont Review of Books 17, no. 3 (Summer 2017): 8–14. 32 George Borjas, We Wanted Workers: Unraveling the Immigration Narrative (New York: Norton, 2016), 126–28. 33 Bob Davis, “The Thorny Economics of Illegal Immigration,” Wall Street Journal, Feb. 9, 2016, https://www.wsj.com/articles/the-thorny-economics-of-illegal-immigration-1454984443. 34 Steve Striffler, “Inside a Poultry Processing Plant: An Ethnographic Portrait,” Labor History 43, no. 3 (2002): 305–13. 35 Peter Cove, Poor No More: Rethinking Dependency and the War on Poverty (New Brunswick, N.J.: Transaction, 2017). 36 See, e.g., David Autor and Melanie Wasserman, Wayward Sons: The Emerging Gender Gap in Labor Markets and Education (Washington: Third Way, 2013). 37 Kevin Williamson, “The Father-Führer,” National Review, Mar. 28, 2016, https://www.nationalreview.com/nrd/articles/432569/father-f-hrer. 39 Michael Strain, “America Owes Its Working Class, Yes. But the Working Class Has Duties, Too,” PostEverything (blog), Washington Post, Dec. 27, 2016, https://www.washingtonpost.com/posteverything/wp/2016/12/27/america-owes-its-working-class-yes-but-the-working-class-has-duties-too/. 39 Amy Goldstein, Janesville: An American Story (New York: Simon and Schuster, 2017). 40 Jason Richwine, “Can Natives Use Their English Literacy to Complement (Rather than Compete with) Immigrant Labor?,” Center for Immigration Studies, June 27, 2017, https://cis.org/Richwine/Can-Natives-Use-Their-English-Literacy-Complement-Rather-Compete-Immigrant-Labor. Jason Richwine is a public policy analyst in Washington, D.C.